When it rains, it pours. That’s how the saying goes and it certainly seems to be true of all the Daredevil-related news to come out of the last few days. In fact, just after I’d posted my last post detailing some recent news (though I forgot to mention the preview art from New Avengers #16, more on that below), a whole pile of additional news, interviews and previews was upon us. We’ll start in reverse chronological order! More news on next year’s original graphic novel Daredevil: Season One has surfaced and you can read all about it – and see more preview art – in this MTV Geek! interview with Johnston and artist Wellington Alves. Earlier in the week, Marvel.com posted a Tuesday Q&A interview with Daredevil writer Mark Waid in which they discuss recent and coming events. Waid reveals some information about what Klaw is up to so if you try to stay away from even mild spoilers, you may want to stay away. MTV Geek! also posted a short video interview with Waid from Baltimore Comic Con. Other news this week concerned some forthcoming details from September’s Daredevil #16 in which Daredevil joins the Avengers. Some preview art (see above or go to CBR to see more) has been released as well as interview in which New Avengers writer Brian Michael Bendis talks quite a bit about what this development will mean for Daredevil. Okay, I think we’re all caught up now. Phew! Feel free to post opinions and reactions below in the comments section. I’m intrigued by the SEASON ONE idea myself. DD does have some of the corniest early adventures, but I think DD: Yellow (which I LOVED) showed that there is potential in some of those stories. I’m really looking forward to seeing where you guys take this Antony. I can’t say I’m crazy about Bendis taking another crack at DD, especially after seeing DD wield the huge machine gun in the preview art. Bendis had a good run with DD, but I feel like it way more spotty than most people admit. For every great story like “Out” you have a less than stellar one like The Murdock Papers (no offense to the blog name Christine, but that one was so full of glaring plotholes I’ve never been able to enjoy it). I absolutely love what Waid is doing with DD and would hate for Bendis to do anything with DD that would blemish or detract from what looks to be a solid DD run. Honestly, he’s getting to play with all the other fun toys in the Marvel Universe…. does he have to have DD too? @antony: Thanks for popping in to comment! I hoped you might. I think it was just me getting the wrong idea at the outset but I figured that there would be more the case of new stories told against the backdrop of the early era – not contradicting anything in terms of continuity but not a re-telling. One of the reasons I thought this would be the case was because of the pre-existence of Daredevil: Yellow. @AP: As I’ve stated earlier, I share your concerns about Daredevil in New Avengers and seeing him with that gun in the preview art made my heart sink a little. While I agree with you that the Bendis run was spottier than people like to remember (about The Murdock Papers, I re-read it recently and found it still gives me a headache), there’s no doubt that Bendis, overall, was a fantastic Daredevil writer. But I can’t deny that I like the things he wrote a few years ago (including things like House of M) MUCH better than any of his recent stuff and I don’t trust that I will enjoy whatever he has Daredevil doing in New Avengers. I hope I will, heck getting a double dose of Daredevil every month sounds great, but I find myself being a bit worried about Bendis doing things like stretching DD’s powers to the extreme or using them in absurd ways (he’s often been guilty of both, much more so than most writers of the last twenty years), writing him out of character (to see him call Matt a “horndog” gave me real pause, as you might recall) and not dealing with some of the reasons Matt has opted against joining the New Avengers in the past. Like I said, I hope I’m wrong to worry – and worry might be too strong a word, we’re talking about comics here after all – and that Bendis will do a good job of this that doesn’t interfere with what Mark Waid is doing. I’m still gonna check out DD:Season One, but I gotta admit I was hoping for a more of a “re-imagination” myself. Something along the lines of what Miller did with “The Man Without Fear” but more lighthearted and less gritty. Not to slight Miller, TMWF is my 2nd favorite DD story ever after “Born Again”. Season One sounds kinda like the Batman minis “Monster Men” and “The Mad Monk” from a few years ago. They were a simple yet well written retelling of Batman’s first adventures from 1939 made more contemporary. I love Daredevil’s origin, and I think a polished up modern retelling needs to happen ever so often for newer readers and to remind us older readers just how cool and unique DD is. I am wondering if this story will include Stick, though I understand if that is privileged (DD Yellow and MWF, though great individual stories fit together poorly in that regard). @ Robert, I would hold off on extrapolating to much from those DD/Giant Gun pictures, They are out of context and those machines he’s shooting don’t really look manned (in any case everyone could take a lesion from Born Again). And the one panel shows him taking one down death machine by hand. 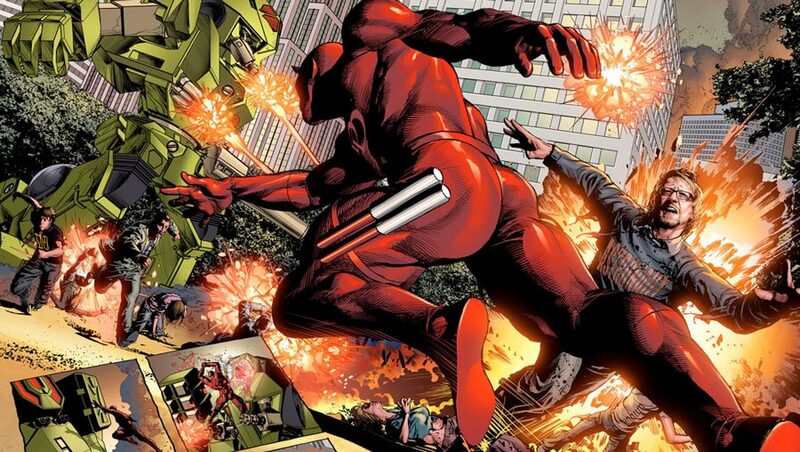 It doesn’t answer the more important question of why Deodato needs to draw Matt with a giant wedgie. Does anyone know why these OGNs are called “____:Season One”? I haven’t noticed in any of the accompanying press releases. Is there a season two planned? “Season” applies to a time of year, so is this going to happen every fall/winter? I’m undecided whether this makes more or less sense than the “Point One Initiative”. Aaron, I believe the Season One styling is meant in the sense of TV seasons, a la Image’s “pilot season” from a few years back. As to whether there’ll be a Season Two, I have no idea.